A very pleasant cul de sac of large bungalows partly located alongside the River Dean and the fields beyond. Every property has a front garden with the minimal use of hedges and fences providing a very open aspect. Those properties along the river have no other property facing them. 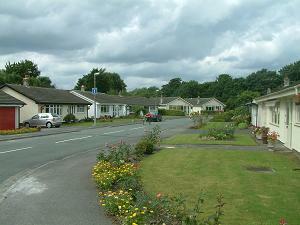 The level aspect of this and adjoining streets makes these bungalows ideal for elderly folk. There are few other bungalows in Bollington, consequently these are in high demand.